I’m still really inspired by the way you can draw simple lines and geometric shapes with basic cables; the design happens from the placement of the cables, rather than the detail of the cable itself. This project uses cables that are elongated and stacked in a spiraling, angular design. 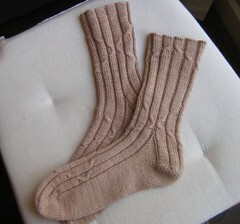 The left and right sock mirror each other for added interest. 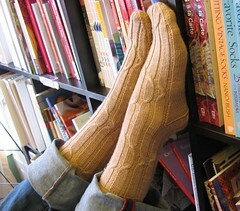 I originally wanted these socks to be like your freshman year in a new endeavor… jump in and get started! I recently updated the pattern to include two sizes and information how to modify the pattern to make an in between size too. Yay! 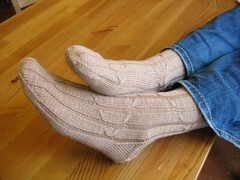 I loved knitting these socks for my husband. Simple enough to read a book at the same time, but with a regular bit of business to make you feel like you are making progress!